With new trade deals being negotiated following the Brexit vote, there are other areas of policy which should not be overlooked. 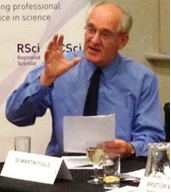 Martin Yuille, Reader in Biobanking/Co-Director of CIGMR at The University of Manchester, argues that science and technology is increasingly a pre-condition for world-class research and therefore, now, after the EU referendum, the UK cannot risk walking away from existing scientific agreements until they have been fully replaced. The EU has made great strides over the last three decades in developing and implementing a joined-up international strategy for cooperation in Science and Technology (S&T). It has 20 treaties in place. As a regional actor, the EU pays particular attention to cooperation with nine other regions in the world – it combines policy dialogue with project-based and other bottom-up cooperation. The UK is party to all these EU, treaties, agreements and dialogues. When the UK joined the Common Market over 40 years ago, British people thought they were joining a free trade area. Today’s critics of the European Union (EU) complain that the EU is so much more. They are therefore allowing that, at the exit door from Brussels, there are areas of policy to negotiate other than trade deals with the rest of the world. One area being overlooked is science and technology (S&T) as a driver of future jobs, future industries and of enhanced international cooperation. For S&T, international cooperation is not merely a laudable aim but is increasingly a pre-condition for world-class research. The EU has made great strides over the last three decades in developing and implementing a joined-up international strategy for cooperation in science and technology (S&T). This strategy has been developed with nine other regional actors, with 20 individual nations where S&T agreements are in place and with 160 other countries where joint S&T projects are in place. The foundation for this international S&T development work is the European Research Area wherein intra-EU governmental agreements leverage the S&T activities of each EU member state for the benefit of all members. The political basis of the EU’s international S&T development work rests ultimately on its treaties among Member States and then on international treaties, agreements, dialogues and projects in a coherent strategy. This type of framework must be put in place by the UK itself as it prepares to leave the EU if the UK does not wish to lose its current capacities and capabilities. As a regional actor, the EU pays particular attention to cooperation with nine other regions in the world. In S&T, it combines policy dialogue with project-based and other bottom-up cooperation. This cooperation seeks synergies with other EU policies and activities, as well as complementarity with EU member states bilateral actions. This synergy strengthens the EU’s role in S&T and makes it a harder task for the UK to replicate outside the EU. Many EU policies have traditionally looked toward S&T for support in development and implementation: cooperation in S&T is a driver of cooperation on other issues. It is not clear whether the UK government shares this view in policy and practise. As the global knowledge society develops, international scientific cooperation has, in the EU’s view, an emerging role as a new pillar of external relations in addition to the traditional ones of diplomacy, trade and development cooperation. The UK government has not dissociated itself from this view and so a new UK pillar should not be weakened by leaving the EU. Twenty bilateral government level agreements on cooperation in science and technology have been put in place. The European Union, via the Research and Innovation Commissioner, has concluded bi-lateral science and technology (S & T) agreements with 20 individual nations: Algeria; Argentina; Australia; Brazil; Canada; Chile; China; Egypt; India; Japan; Jordan; Korea; Mexico; Morocco; New Zealand; Russia; South Africa; Tunisia; Ukraine; United States. “Each Party shall take all appropriate steps and use its best efforts, pursuant to the laws and regulations applicable in the territories of each Party, to facilitate entry to, sojourn and exit from its territory of persons, material, data and equipment related to or used in cooperative activities developed by the Parties under this Agreement”. This then points to a need in Brexit talks for a more nuanced approach to freedom of movement of workers than the current “No, no, no”. These 20 agreements constitute a framework and a privileged forum to identify common interests, priorities, policy dialogue, and the necessary tools for S&T collaboration. The agreements have borne fruit in joint S&T projects. An expert group has evaluated positively these projects and other work. In the current Horizon 2020 (H2020) programme, international cooperation is a cross-cutting priority with specific funding for international cooperation policy support activities. H2020 is fully open to researchers from all over the globe and 16 nations have international agreements that formalise this. Nearly 850 joint research projects are in place with 160 nations via the Commissioner for International Cooperation and Development. These projects are the consequence of a series of interlocking international agreements and negotiations. These nations include some with which the UK has only ever had the most tenuous links. Former French colonies, for example, fall into this category. But now we have started to build collaborative links via EU-funded projects. To lose those links not only harms research but also sets back by decades the development of peaceful cooperation, development and trade. The UK is party to all these directives, treaties, agreements and dialogues. Its researchers, paid for in part from the UK’s EU contribution, are active in many of the ongoing projects. It therefore accepts their value (although this writer is unaware of any central catalogue of projects that have UK participation and are funded by the UK via the EU). It follows that to walk away from any of these actions would result in a loss of value to the UK. Hence Brexit negotiations need to ensure a full replacement of agreements on S&T with regions and with nations around the world if future UK jobs and future UK industries are not to be imperilled. In this blog I have focussed on international scientific and technological treaties and agreements that the UK is at risk of just walking away from. But for decades, EU diplomats have been establishing relations on every imaginable issue with the rest of world – not solely issues connected with science. If we are to leave the EU but not ignore the rest of the world, then we must not lose any of these advantages. This means there is a great deal of diplomacy to do. And since diplomacy is slow and its success is not guaranteed, the UK is taking on substantial risks. Whether all the risks are worth one highly-disputed benefit – loss of the “freedom of movement” of EU workers – is a matter which the British people have not reflected on. Martin Yuille MA (Oxon), PhD (Edin) has a background in biochemistry, molecular genetics, haematological oncology, research infrastructure development and epidemiology. His current interests are in the re-alignment of health and other public policy to enable exploitation of molecular tools to improve population health. Before coming to Manchester, his research was carried out at the universities of Cambridge, Stanford, New York State and at the Institute for Cancer Research (London) and the Medical Research Council (Hinxton).